When I get stuck in amber, cannot seem to move ahead or back (often in the summer heat), I revert to well-tried practices of Spirit that have energized me in the past. So this summer I have reclaimed the Ignatian practice of the daily examen. I first learned this practice in a winsome and accessible book by the Linns called Sleeping with Bread. They describe simply the daily practice of reviewing one’s day with a set of questions: “Where did I experience Grace today?” and “where did I feel farthest from Grace today?” Alternately, one could ask :where did I feel the most freedom?” and “where did I feel most restricted?” The answers to these prayerful questions then may lead to prayer, first those of gratitude, and then to prayers for forgiveness, for wisdom, for healing. I love this concrete, do-able exercise, for it helps me pay attention to my life in God, and helps direct my prayer to specific area of longing and need. During these months I discovered…or was led to…a new book called Reimagining the Ignatian Examen by Mark E. Thibodeaux, SJ, (Loyola Press, 2015) in which he deepens the basic premises of the examen, then focus them in thirty-four specific area of questioning designed to take one into the heart of each question. In using the book, I was instructed to begin in gratitude for particular gifts of the previous day. (I need to use this prayer in the morning; i am too sleepy at night!). Then, I was directed to review my day in light of the day’s focus, such as habits or thoughts, words, deeds, or discernment. Taking not more than 15 minutes, likening my responses to “tweet-size journaling,” I was able to recall, savor and then to examine in a more precise way i which I had encountered the Holy One and where I needed to ask for something–forgiveness, assurance, wisdom, all with a more pointed direction. I became aware that all too often my prayer has been generic…”God, bless us all” kinds of prayers, but that I longed to be more concrete, more specific in my relationship with Christ and more conscious of that holy encounter when I was aware of the Presence, the Breath, the Fire, the Grace. So I was delighted to be prodded to something more. Over the course of the summer days, especially the dog-days in which we are now living, the keenness of each day’s particular questions often became a sign post pointing me in the direction of other connected, synergistic signs by which I could notice God’s presence, and hear God’s word. On a day when the examen directed me to think about the question, “what do you seek?”, I was then asked to preach on a text from Mark’s gospel in which the question was, “what do you want me to do for you?” In response in my own musings and in preparation for bringing the Word, I needed to dig in my soul for answers to those connected questions. 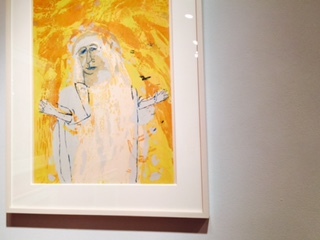 After a day of asking the question, “Who wore God’s face today?,” I saw at an exhibit of the art of Corita Kent an early painting of hers, in which a woman is holding up both hands in prayer, as if she is offering up both her gloriousness as a creature of God and her frailty as a human being. A powerful selection on Choosing Life led me into walking through many days mindful of whether this action in which I was engaged was one in which I was choosing life or choosing death by not inhabiting my life. And so energy has begun to flow, attention is being paid, love is blooming. The amber is set aside for the another time, and the the “sacrament of the present moment” is being honored. Ahead of me lies a connection with a friend, a performance of a young person, a reading with my beloved, a larky trip with children and grandchildren–all moments full of movement, possibility, hope and prayer. The examen-ed life is well worth living! Personal photo of painting by Corita Kent at Pasadena Museum of California Art.